Home District (TSX-Venture: DCOP) has just amassed a large position in the middle of Canada’s newest gold rush. District (TSX-Venture: DCOP) has just amassed a large position in the middle of Canada’s newest gold rush. Following an epic rise from 2000-2012, experts agree gold is once again primed for a major bull market move. Investors are interested in Canada’s hottest new gold rush in Central Newfoundland, one of the top mining jurisdictions in the world. Our top gold pick, District Copper Corp (TSX Venture: DCOP), trading at it’s 52-week low, has quietly amassed one of the largest land positions in a highly mineralized gold trend in Central Newfoundland’s newest gold discovery district. District Copper Corp (TSX Venture: DCOP) has just raised capital to finance an inaugural exploration program on its highly prospective asset. Between 2000 and 2012 the price of gold made a spectacular run, rising from under $300 USD/ounce to over $1,800 for a percentage gain of over 600%. This translates into an annualized rate of return of 15%. The S&P 500 in the same period remained flat. When inflation is factored in, gold turned out to be a major win for investors. For a physical asset held as a hedge against an uncertain economy, this is an incredibly impressive gain. Since 2012 the price has naturally corrected and stabilized – and the most powerful investors on the planet believe it’s getting ready for the next major rally. 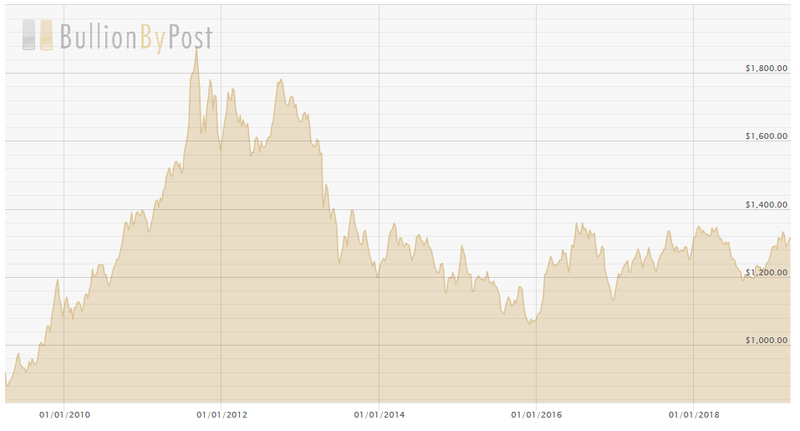 While we’re excited about the imminent breakout in the price of gold, that is not where our attention is. If you had purchased shares in carefully selected junior gold mining and exploration stocks while the price of gold was rocketing, you would have walked away with a fortune. Long considered to be speculative and risky, junior mining and exploration companies purchased at the right price and right time have the ability to transform your portfolio and produce incredible wealth in a very short period of time. We’re not referring to a 15% annualized gain over a decade. Investing in the right stocks during a gold bull market can easily net you a 500% – 1000% gain in a matter of months, perhaps even weeks. Massive profits are realized by investors savvy enough to buy shares in companies exploring for gold in what are known as “area plays”. An area play develops when a company exploring for gold in a specific region all of a sudden hit’s paydirt – perhaps a massive gold vein, extending along an extensive strike length. Discoveries like this are rare, and lead to major stock moves. When word gets out, a staking rush around the discovery ensues, resulting in dozens of companies vying for land, hoping for a piece of the action. I’ve been investing in the gold exploration sector for over 25 years, and have participated in a fair share of these area plays. I’ve scored big each and every time. Voisey’s Bay, Newfoundland. The Golden Triangle in B.C. The White Gold discovery in the Yukon. To name a few. They don’t come around often, but when they do I pay close attention, do my research and invest heavily. Last year in July an unknown company drilling for gold in Central Newfoundland intersected a mineralized gold vein that sent the stock soaring nearly 2000% in a matter of weeks and ushered in a staking rush unlike the world has seen in decades. Investor’s fortunate enough to catch the rocket ride upwards made off with fortunes. If you are not a mining stock enthusiast, you may not realize that the province of Newfoundland is endowed with incredible mineral riches. Veteran geologists and major mining companies have yet to fully comprehend and discover the vast potential this exciting jurisdiction has to offer. In fact, many believe that this is just the tip of the iceberg in terms of mineral wealth for this eastern outpost in Canada. Considered to be one of the world’s top destinations for mining, Newfoundland is once again making headlines with the latest discovery of a richly mineralized gold trend. I’m referring to what is now known as the Marathon gold camp, home to several multi-million ounce gold discoveries valued in the billions of dollars. Don’t let the name fool you. District Copper Corp does indeed hold a valuable copper asset in B.C. And we will cover that in a future report. Right now however, all eyes are on this hot new gold discovery in Central Newfoundland. Hedge funds and blue chip mining companies have been pouring millions of dollars into the region in hopes of securing the world’s next major gold mine. Globally renowned veteran geologists and hedge fund investors have already snapped up large swaths of land in this region. Nearly all of the most valuable land has been staked, optioned out or purchased outright. Yet there is one massive parcel of land, right in the middle of this rich gold trend, that was quietly (and privately) staked years before the recent discovery started making headlines. The seasoned management team at District Copper Corp quickly and quietly struck a deal with a group of veteran geologists who originally sniffed out the immense potential of this area, long before the crowd arrived. DCOP’s newly acquired “Stony Lake” gold project is located within an important regional structural zone striking through Southwest, Central and Northeast Newfoundland. This structural zone controls the distribution of gold mineralization in this part of Newfoundland and hosts several large, high grade gold deposits including Cape Ray gold deposits, Quadro Resources Staghorn gold zones, Marathon’s massive Valentine Lake gold camp, Antler Gold’s recently discovered high-grade gold zones, the Twilight gold zone, the new local high grade Moosehead discovery and very likely DCOP’s Stony Lake gold showings. District Copper Corp’s Stony Lake asset is prime real estate in the hottest mining region in Canada. The Central Park penthouse of gold exploration. Management of District Copper Corp (TSX Venture: DCOP) swiftly approached the owners of this incredibly valuable land package with a deal we believe will handsomely reward original stake holders and newly interested shareholders of DCOP. While District Copper Corp already holds has an impressive (and large) copper project in B.C., the sizzle on this steak is by far DCOP’s stealth acquisition of the Stony Lake project in Central Newfoundland. In fact, not too far from Stony Lake is Marathon Gold’s 2.7 million ounce gold deposit (and could be upwards of 4 million ounces when all is said and done). Marathon Gold Corp’s market capitalization is currently ~$160 million. District Copper Corp’s (TSX Venture: DCOP) market capitalization is less than $6 million. The upside potential here, while not yet discovered by the general investment community yet, is immense to say the least. DCOP’s copper (and base metals) project in B.C. (Eaglehead) is worth far more than the company’s current market capitalization. We believe DCOP investors are getting Eaglehead for free. 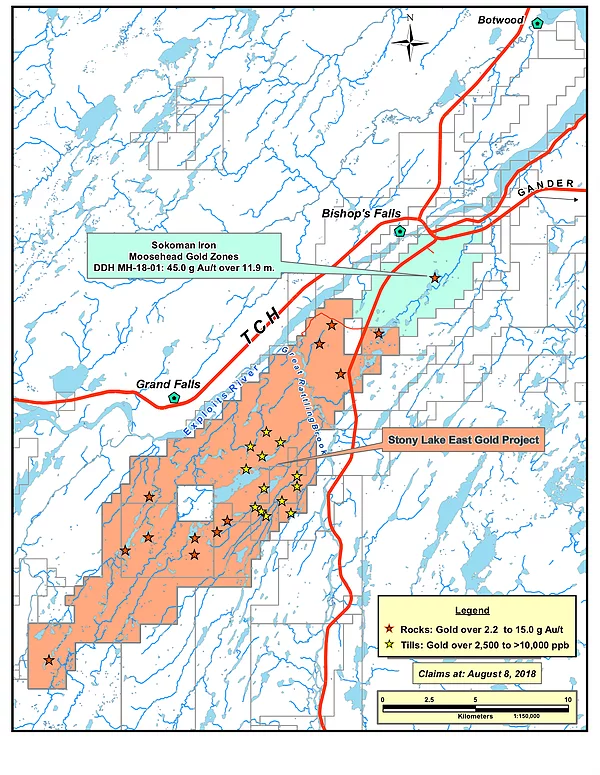 It’s the multi-million ounce gold potential of Stony Lake that has our complete attention at the moment. The speculative potential alone is capable of boosting the share price significantly. Spring is here, the snow is starting to melt and District Copper Corp is making preparations for Stony Lake’s first modern exploration campaign. We believe strong move upward is imminent as the company descends onto the project to finally validate the robust geological model that has been demonstrated by historical exploration. As you read this, the company is gathering critical data for Stony Lake’s first ever comprehensive exploration and drill program. The claim map below outlines several high priority targets that have been identified by historical prospecting. Each of the 25 star markers on this map represents a potentially rich gold strike. When tied together, we could be looking at a gold deposit to rival the biggest in the area. As investors turn their attention back to this area play as the busy Spring exploration season arrives, District Copper Corp stands head and shoulders above the rest of the crowd. We could potentially be looking at Canada’s next multi-million ounce gold mine. If you missed out on area play action in the past, we believe this one is being delivered to you on a golden platter. District Copper Corp (DCOP) has just raised $590,000 at 0.05/share. Funding has been secured for a Spring/Summer exploration program on Stony Lake. We anticipate drills will be turning on the followup phase of exploration targeting the highest priority discoveries on this large, richly endowed project. And when drills turn, stocks churn. We have not found a company that comes close to the size, quality and proximity to the rich gold trend that DCOP’s Stony Lake encompasses. For this reason alone we believe shares in DCOP have the highest potential for the strongest gains in the shortest period of time. With the stock recently trending at a 52-week low, the downside risk seems to be at bare minimum while upside potential is blue sky. When the company first announced it’s intention to acquire Stony Lake in August 2018, investors sent the stock soaring nearly 300% in days with over 20 million shares exchanging hands. This powerful move has proven that a large investor base is waiting on the sidelines, ready to jump back in. Investor’s who waited last year missed an easy 200% – 300% move on DCOP. The opportunity for an even stronger near term performance exists as District Copper Corp moves to aggressively advance this incredibly well positioned gold asset. The company, for the first time, will reveal to the world what true potential and value is hidden on their 13,000 hectare Stony Lake asset. For this reason we believe District Copper Corp (DCOP) should be on everyone’s watchlist. Check out their website and sign up for email updates – you surely won’t want to miss a beat on this developing story. Nothing in this publication should be considered as personalized financial advice. We are not licensed under any securities laws to address your particular financial situation. No communication by our employees to you should be deemed as personalized financial advice. Please consult a licensed financial advisor before making any investment decision. This is a paid advertisement and is neither an offer nor recommendation to buy or sell any security. We hold no investment licenses and are thus neither licensed nor qualified to provide investment advice. The content in this report or email is not provided to any individual with a view toward their individual circumstances. MicrocapStockwire.com is a website owned by Mountain Capital Corp (“Mountain”). Mountain is receiving $2,500 per month from District Copper Corp. to host this content, in addition to an advertising budget for ad purchasing and digital marketing. This compensation constitutes a conflict of interest as to our ability to remain objective in our communication regarding the profiled company. Because of this conflict, individuals are strongly encouraged to not use this newsletter as the basis for any investment decision.